"Blind pig" redirects here. For other uses, see Blind pig (disambiguation). A speakeasy, also called a blind pig or blind tiger, is an illicit establishment that sells alcoholic beverages. Such establishments came into prominence in the United States during the Prohibition era (1920–1933, longer in some states). During that time, the sale, manufacture, and transportation (bootlegging) of alcoholic beverages was illegal throughout the United States. Speakeasies largely disappeared after Prohibition was ended in 1933, and the term is now often used to describe retro style bars. In the United States, the word emerged in the 1880s. The earliest recorded use is from an 1889 newspaper, "Unlicensed saloons in Pennsylvania are known as 'speak-easies'." They were "so called because of the practice of speaking quietly about such a place in public, or when inside it, so as not to alert the police or neighbors". The term is reported to have originated with saloon owner Kate Hester, who ran an unlicensed bar in the 1880s in the Pittsburgh area town of McKeesport, Pennsylvania, often telling her rowdy customers to "speak easy" to avoid attention from authorities. Many years later, in Prohibition-era America, the "speakeasy" became a common name to describe a place to get an illicit drink. Different names for speakeasies were created. The terms "blind pig" and "blind tiger" originated in the United States in the 19th century. These terms were applied to establishments that sold alcoholic beverages illegally, and they are still in use today. The operator of an establishment (such as a saloon or bar) would charge customers to see an attraction (such as an animal) and then serve a "complimentary" alcoholic beverage, thus circumventing the law. In desperate cases it has to betake itself to the exhibition of Greenland pigs and other curious animals, charging 25 cents for a sight of the pig and throwing in a gin cocktail gratuitously. [They] are in a mysterious place called a blind tiger, drinking the very bad whiskey for which Prohibition is indirectly responsible. "Blind tiger" also referred to illegal drinking establishments in which the seller's identity was concealed. A drawer runs into a wall of what appears to be a billiard saloon. You pull out the drawer, drop in your change, shove the drawer back, call for what you want and then pull out the drawer again and there it is, "Straight" or "Spiked" just as you'd have it. Nobody is heard or seen, and the blind tiger, apparently without any keeper, works like a charm. Speakeasies, though illegal, were numerous and popular during the Prohibition years. Some were operated by people who were part of organized crime. Even though police and agents of the Bureau of Prohibition would often raid them and arrest their owners and patrons, they were so profitable that they continued to flourish. The speakeasy soon became one of the biggest parts of American culture during this time. Several changes happened as speakeasies formed; one was with integration. With "black and tans", people of all races, black or white, would gather together and even mingle. People would mix together and have few or no problems. Another change that occurred was more participation from women. Many businesses would set up their speakeasies to attract women to get more profits. Women also began to insert themselves into the business of speakeasies. Texas Guinan, a former screen and stage actress, opened many speakeasies during Prohibition such as the 300 Club and the El Fey. Guinan greeted customers with "Hey Suckers" and admitted she'd be nothing without Prohibition. Her two biggest competitors were Helen Morgan and Belle Livingston. Culture was also affected by speakeasies during prohibition and the speakeasy became a focal point. An example to show this was in the movie theaters. Companies were restricted from depicting alcohol on screen, but some still continued to do so because they felt it showed the way Americans lived, such as the scene in Our Dancing Daughters in which Joan Crawford dances on a table in a speakeasy. The poor quality bootleg liquor sold in some speakeasies was responsible for a shift away from 19th-century "classic" cocktails, that celebrated the raw taste of the liquor (such as the gin cocktail, made with Genever (sweet) gin), to new cocktails aimed at masking the taste of rough moonshine. These masking drinks were termed "pansies" at the time (although some, such as the Brandy Alexander, would now be termed "classic"). The quality of the alcohol sold in speakeasies ranged from very poor to very good, depending on the owner's source. Cheap liquor was generally used because it was more profitable. In other cases, brand names were used to specify the type of alcohol people wanted. However, sometimes when brand names were used, some speakeasies cheated; they lied to their customers by giving them poor quality liquor instead of the higher-quality liquor the customer ordered. Prices were four to five dollars a bottle. From the beginning the speakeasy was relatively small with little or no entertainment involved, but through gradual growth it popularized and expanded to many different areas with new additions of entertainment and eventually made the speakeasy one of the biggest businesses during Prohibition. In many rural towns, small speakeasies and blind pigs were operated by local business owners. These family secrets were often kept even after Prohibition ended. In 2007 secret underground rooms thought to have been a speakeasy were found by renovators on the grounds of the Cyber Cafe West in Binghamton, New York. Speakeasies did not need to be big to operate. "It didn't take much more than a bottle and two chairs to make a speakeasy." 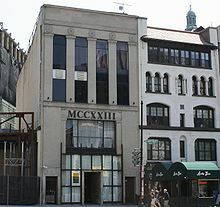 One example for a speakeasy location was the "21" Club in New York. This is one of the more famous of the speakeasies and still stands today. The "21" Club was only part of a series of businesses owned by Charlie Berns and Jack Kriendler. They started the business in Greenwich with a place called "The Redhead" and later moved onto the next operation "The Puncheon Club". The "21" Club was special because of its system to remain under the radar. It was a unique system that used a doorkeeper to send a warning to the bar that it was in danger and the bar would transform into an ordinary place through a mechanism. The speakeasy spread all over New York with businesses such as the "Bath Club" and "O'Leary's on the Bowery". All of the different speakeasies that spread throughout had their own specialty that made it unique. "The Bath Club" had musicians perform in their place to keep it unique. This idea of musicians spread throughout the speakeasy business and soon enough many of them had musicians. ^ a b Brown, Peter Jensen. "Liquor Licenses, Steelworkers and the British Navy - an Unlicensed History and Etymology of "Speakeasies"". Early Sports and Pop-Culture History Blog. Retrieved August 13, 2014. ^ "The Soothing System". Sydney Herald. Sydney, Australia. November 20, 1837. p. 3. ^ "Munch goes to the Blind Pig". Pittsburgh Post-Gazette. June 30, 2011. ^ Bill Toland (December 4, 2013). "Prohibition ended 80 years ago today, but the dry movement never worked here". Pittsburgh Post-Gazette. ^ Mark., Morton, (2004). Cupboard Love 2 : a Dictionary of Culinary Curiosities. Toronto: Insomniac Press. ISBN 9781897415931. OCLC 437182733. ^ 1948-, Okrent, Daniel, (2010). Last call : the rise and fall of Prohibition (First Scribner hardcover ed.). New York: Scribner. ISBN 9780743277020. OCLC 419812305. ^ "Denton's Doings". Dallas Weekly Herald. May 29, 1875. p. 2. ^ Shay, "Ten Best Cocktails of 1934", Esquire Vol. 2, December 1934, p. 40. ^ Grimes, "Bar, What Bar? ", The New York Times, June 2, 2009. ^ Okrent, Daniel. Last Call: The Rise and Fall of Prohibition. New York: Scribner, 2010. p. 210. ^ Okrent, Daniel. Last Call: The Rise and Fall of Prohibition. New York: Scribner, 2010. p. 208. ^ Okrent, Daniel. Last Call: The Rise and Fall of Prohibition. New York: Scribner, 2010. pp. 208–209. Loretta Britten, Paul Math, ed. Our American Century Jazz Age: The 20s. 1998. Time Life Books. New York: Bishop Books Inc., 1969. ISBN 0-7835-5509-1. Kahn, Gordon, and Al Hirschfeld. The Speakeasies of 1932. New York: Glenn Young Books, (1932, rev. 2003). ISBN 1-55783-518-7. Streissguth, Thomas. The Dry Years: The Roaring Twenties. Encyclopedia. 2007 ed. Facts On File, Inc. ISBN 0-8160-6423-7. Galperina, Marina. "The Museum of the American Gangster Opens Doors of Former Speakeasy in March". February 19, 2010. Animal New York. 25 March 2010.